Sahih International And who believe in what has been revealed to you, [O Muhammad], and what was revealed before you, and of the Hereafter they are certain [in faith]. Sahih International Those are upon [right] guidance from their Lord, and it is those who are the successful. Sahih International Indeed, those who disbelieve - it is all the same for them whether you warn them or do not warn them - they will not believe. Sahih International Allah has set a seal upon their hearts and upon their hearing, and over their vision is a veil. And for them is a great punishment. Sahih International And of the people are some who say, "We believe in Allah and the Last Day," but they are not believers. Sahih International They [think to] deceive Allah and those who believe, but they deceive not except themselves and perceive [it] not. Sahih International In their hearts is disease, so Allah has increased their disease; and for them is a painful punishment because they [habitually] used to lie. Sahih International And when it is said to them, "Do not cause corruption on the earth," they say, "We are but reformers." Sahih International Unquestionably, it is they who are the corrupters, but they perceive [it] not. Sahih International And when it is said to them, "Believe as the people have believed," they say, "Should we believe as the foolish have believed?" Unquestionably, it is they who are the foolish, but they know [it] not. Sahih International And when they meet those who believe, they say, "We believe"; but when they are alone with their evil ones, they say, "Indeed, we are with you; we were only mockers." Sahih International [But] Allah mocks them and prolongs them in their transgression [while] they wander blindly. Sahih International Those are the ones who have purchased error [in exchange] for guidance, so their transaction has brought no profit, nor were they guided. Sahih International Their example is that of one who kindled a fire, but when it illuminated what was around him, Allah took away their light and left them in darkness [so] they could not see. Sahih International Deaf, dumb and blind - so they will not return [to the right path]. Sahih International Or [it is] like a rainstorm from the sky within which is darkness, thunder and lightning. They put their fingers in their ears against the thunderclaps in dread of death. But Allah is encompassing of the disbelievers. Sahih International The lightning almost snatches away their sight. Every time it lights [the way] for them, they walk therein; but when darkness comes over them, they stand [still]. And if Allah had willed, He could have taken away their hearing and their sight. Indeed, Allah is over all things competent. Sahih International [He] who made for you the earth a bed [spread out] and the sky a ceiling and sent down from the sky, rain and brought forth thereby fruits as provision for you. So do not attribute to Allah equals while you know [that there is nothing similar to Him]. Sahih International And if you are in doubt about what We have sent down upon Our Servant [Muhammad], then produce a surah the like thereof and call upon your witnesses other than Allah , if you should be truthful. Sahih International But if you do not - and you will never be able to - then fear the Fire, whose fuel is men and stones, prepared for the disbelievers. Sahih International And give good tidings to those who believe and do righteous deeds that they will have gardens [in Paradise] beneath which rivers flow. Whenever they are provided with a provision of fruit therefrom, they will say, "This is what we were provided with before." And it is given to them in likeness. And they will have therein purified spouses, and they will abide therein eternally. Sahih International Who break the covenant of Allah after contracting it and sever that which Allah has ordered to be joined and cause corruption on earth. It is those who are the losers. Sahih International How can you disbelieve in Allah when you were lifeless and He brought you to life; then He will cause you to die, then He will bring you [back] to life, and then to Him you will be returned. Sahih International It is He who created for you all of that which is on the earth. Then He directed Himself to the heaven, [His being above all creation], and made them seven heavens, and He is Knowing of all things. Sahih International And [mention, O Muhammad], when your Lord said to the angels, "Indeed, I will make upon the earth a successive authority." They said, "Will You place upon it one who causes corruption therein and sheds blood, while we declare Your praise and sanctify You?" Allah said, "Indeed, I know that which you do not know." Sahih International And He taught Adam the names - all of them. Then He showed them to the angels and said, "Inform Me of the names of these, if you are truthful." Sahih International They said, "Exalted are You; we have no knowledge except what You have taught us. Indeed, it is You who is the Knowing, the Wise." Sahih International He said, "O Adam, inform them of their names." And when he had informed them of their names, He said, "Did I not tell you that I know the unseen [aspects] of the heavens and the earth? And I know what you reveal and what you have concealed." Sahih International And [mention] when We said to the angels, "Prostrate before Adam"; so they prostrated, except for Iblees. He refused and was arrogant and became of the disbelievers. Sahih International And We said, "O Adam, dwell, you and your wife, in Paradise and eat therefrom in [ease and] abundance from wherever you will. But do not approach this tree, lest you be among the wrongdoers." Sahih International But Satan caused them to slip out of it and removed them from that [condition] in which they had been. And We said, "Go down, [all of you], as enemies to one another, and you will have upon the earth a place of settlement and provision for a time." Sahih International Then Adam received from his Lord [some] words, and He accepted his repentance. Indeed, it is He who is the Accepting of repentance, the Merciful. Sahih International We said, "Go down from it, all of you. And when guidance comes to you from Me, whoever follows My guidance - there will be no fear concerning them, nor will they grieve. Sahih International And those who disbelieve and deny Our signs - those will be companions of the Fire; they will abide therein eternally." Sahih International O Children of Israel, remember My favor which I have bestowed upon you and fulfill My covenant [upon you] that I will fulfill your covenant [from Me], and be afraid of [only] Me. Sahih International And believe in what I have sent down confirming that which is [already] with you, and be not the first to disbelieve in it. And do not exchange My signs for a small price, and fear [only] Me. Sahih International And do not mix the truth with falsehood or conceal the truth while you know [it]. Sahih International And establish prayer and give zakah and bow with those who bow [in worship and obedience]. Sahih International Do you order righteousness of the people and forget yourselves while you recite the Scripture? Then will you not reason? Sahih International Who are certain that they will meet their Lord and that they will return to Him. Sahih International O Children of Israel, remember My favor that I have bestowed upon you and that I preferred you over the worlds. Sahih International And fear a Day when no soul will suffice for another soul at all, nor will intercession be accepted from it, nor will compensation be taken from it, nor will they be aided. Sahih International And [recall] when We saved your forefathers from the people of Pharaoh, who afflicted you with the worst torment, slaughtering your [newborn] sons and keeping your females alive. And in that was a great trial from your Lord. Sahih International And [recall] when We parted the sea for you and saved you and drowned the people of Pharaoh while you were looking on. Sahih International And [recall] when We made an appointment with Moses for forty nights. Then you took [for worship] the calf after him, while you were wrongdoers. Sahih International Then We forgave you after that so perhaps you would be grateful. 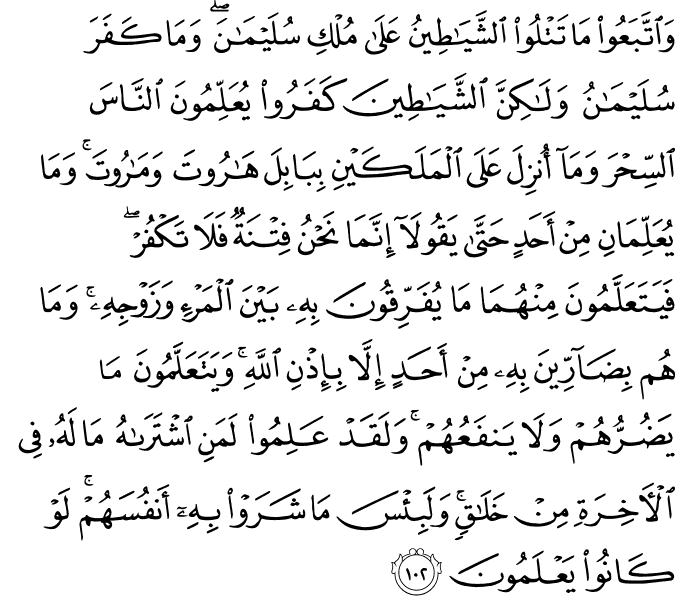 Sahih International And [recall] when We gave Moses the Scripture and criterion that perhaps you would be guided. Sahih International And [recall] when Moses said to his people, "O my people, indeed you have wronged yourselves by your taking of the calf [for worship]. So repent to your Creator and kill yourselves. That is best for [all of] you in the sight of your Creator." Then He accepted your repentance; indeed, He is the Accepting of repentance, the Merciful. Sahih International And [recall] when you said, "O Moses, we will never believe you until we see Allah outright"; so the thunderbolt took you while you were looking on. Sahih International Then We revived you after your death that perhaps you would be grateful. Sahih International And We shaded you with clouds and sent down to you manna and quails, [saying], "Eat from the good things with which We have provided you." And they wronged Us not - but they were [only] wronging themselves. Sahih International And [recall] when We said, "Enter this city and eat from it wherever you will in [ease and] abundance, and enter the gate bowing humbly and say, 'Relieve us of our burdens.' We will [then] forgive your sins for you, and We will increase the doers of good [in goodness and reward]." Sahih International But those who wronged changed [those words] to a statement other than that which had been said to them, so We sent down upon those who wronged a punishment from the sky because they were defiantly disobeying. Sahih International And [recall] when Moses prayed for water for his people, so We said, "Strike with your staff the stone." And there gushed forth from it twelve springs, and every people knew its watering place. "Eat and drink from the provision of Allah , and do not commit abuse on the earth, spreading corruption." Sahih International And [recall] when you said, "O Moses, we can never endure one [kind of] food. So call upon your Lord to bring forth for us from the earth its green herbs and its cucumbers and its garlic and its lentils and its onions." [Moses] said, "Would you exchange what is better for what is less? Go into [any] settlement and indeed, you will have what you have asked." And they were covered with humiliation and poverty and returned with anger from Allah [upon them]. 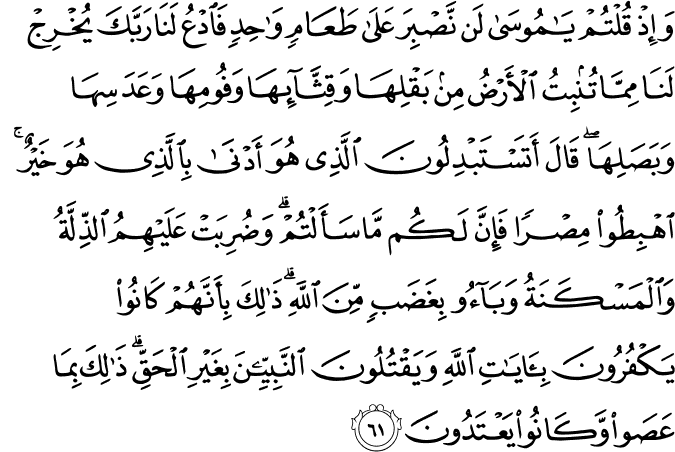 That was because they [repeatedly] disbelieved in the signs of Allah and killed the prophets without right. That was because they disobeyed and were [habitually] transgressing. Sahih International Indeed, those who believed and those who were Jews or Christians or Sabeans [before Prophet Muhammad] - those [among them] who believed in Allah and the Last Day and did righteousness - will have their reward with their Lord, and no fear will there be concerning them, nor will they grieve. Sahih International And [recall] when We took your covenant, [O Children of Israel, to abide by the Torah] and We raised over you the mount, [saying], "Take what We have given you with determination and remember what is in it that perhaps you may become righteous." Sahih International Then you turned away after that. And if not for the favor of Allah upon you and His mercy, you would have been among the losers. Sahih International And you had already known about those who transgressed among you concerning the sabbath, and We said to them, "Be apes, despised." Sahih International And We made it a deterrent punishment for those who were present and those who succeeded [them] and a lesson for those who fear Allah . Sahih International And [recall] when Moses said to his people, "Indeed, Allah commands you to slaughter a cow." They said, "Do you take us in ridicule?" He said, "I seek refuge in Allah from being among the ignorant." Sahih International They said, "Call upon your Lord to make clear to us what it is." [Moses] said, "[ Allah ] says, 'It is a cow which is neither old nor virgin, but median between that,' so do what you are commanded." Sahih International They said, "Call upon your Lord to show us what is her color." He said, "He says, 'It is a yellow cow, bright in color - pleasing to the observers.' "
Sahih International They said, "Call upon your Lord to make clear to us what it is. Indeed, [all] cows look alike to us. And indeed we, if Allah wills, will be guided." Sahih International He said, "He says, 'It is a cow neither trained to plow the earth nor to irrigate the field, one free from fault with no spot upon her.' " They said, "Now you have come with the truth." So they slaughtered her, but they could hardly do it. Sahih International And [recall] when you slew a man and disputed over it, but Allah was to bring out that which you were concealing. Sahih International So, We said, "Strike the slain man with part of it." Thus does Allah bring the dead to life, and He shows you His signs that you might reason. Sahih International Then your hearts became hardened after that, being like stones or even harder. For indeed, there are stones from which rivers burst forth, and there are some of them that split open and water comes out, and there are some of them that fall down for fear of Allah . And Allah is not unaware of what you do. Sahih International Do you covet [the hope, O believers], that they would believe for you while a party of them used to hear the words of Allah and then distort the Torah after they had understood it while they were knowing? Sahih International And when they meet those who believe, they say, "We have believed"; but when they are alone with one another, they say, "Do you talk to them about what Allah has revealed to you so they can argue with you about it before your Lord?" Then will you not reason? Sahih International But do they not know that Allah knows what they conceal and what they declare? Sahih International And among them are unlettered ones who do not know the Scripture except in wishful thinking, but they are only assuming. Sahih International So woe to those who write the "scripture" with their own hands, then say, "This is from Allah ," in order to exchange it for a small price. Woe to them for what their hands have written and woe to them for what they earn. Sahih International And they say, "Never will the Fire touch us, except for a few days." Say, "Have you taken a covenant with Allah ? For Allah will never break His covenant. Or do you say about Allah that which you do not know?" Sahih International Yes, whoever earns evil and his sin has encompassed him - those are the companions of the Fire; they will abide therein eternally. Sahih International But they who believe and do righteous deeds - those are the companions of Paradise; they will abide therein eternally. Sahih International And [recall] when We took the covenant from the Children of Israel, [enjoining upon them], "Do not worship except Allah ; and to parents do good and to relatives, orphans, and the needy. And speak to people good [words] and establish prayer and give zakah." Then you turned away, except a few of you, and you were refusing. Sahih International And [recall] when We took your covenant, [saying], "Do not shed each other's blood or evict one another from your homes." Then you acknowledged [this] while you were witnessing. Sahih International Then, you are those [same ones who are] killing one another and evicting a party of your people from their homes, cooperating against them in sin and aggression. And if they come to you as captives, you ransom them, although their eviction was forbidden to you. So do you believe in part of the Scripture and disbelieve in part? Then what is the recompense for those who do that among you except disgrace in worldly life; and on the Day of Resurrection they will be sent back to the severest of punishment. And Allah is not unaware of what you do. Sahih International Those are the ones who have bought the life of this world [in exchange] for the Hereafter, so the punishment will not be lightened for them, nor will they be aided. Sahih International And We did certainly give Moses the Torah and followed up after him with messengers. And We gave Jesus, the son of Mary, clear proofs and supported him with the Pure Spirit. But is it [not] that every time a messenger came to you, [O Children of Israel], with what your souls did not desire, you were arrogant? And a party [of messengers] you denied and another party you killed. Sahih International And they said, "Our hearts are wrapped." But, [in fact], Allah has cursed them for their disbelief, so little is it that they believe. Sahih International And when there came to them a Book from Allah confirming that which was with them - although before they used to pray for victory against those who disbelieved - but [then] when there came to them that which they recognized, they disbelieved in it; so the curse of Allah will be upon the disbelievers. Sahih International How wretched is that for which they sold themselves - that they would disbelieve in what Allah has revealed through [their] outrage that Allah would send down His favor upon whom He wills from among His servants. So they returned having [earned] wrath upon wrath. And for the disbelievers is a humiliating punishment. Sahih International And when it is said to them, "Believe in what Allah has revealed," they say, "We believe [only] in what was revealed to us." And they disbelieve in what came after it, while it is the truth confirming that which is with them. Say, "Then why did you kill the prophets of Allah before, if you are [indeed] believers?" Sahih International And Moses had certainly brought you clear proofs. 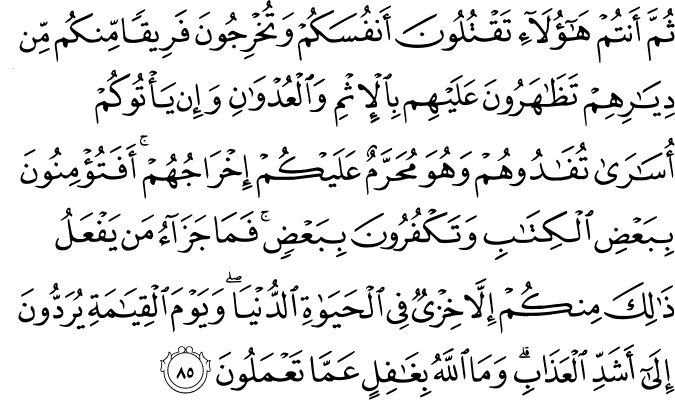 Then you took the calf [in worship] after that, while you were wrongdoers. Sahih International And [recall] when We took your covenant and raised over you the mount, [saying], "Take what We have given you with determination and listen." They said [instead], "We hear and disobey." And their hearts absorbed [the worship of] the calf because of their disbelief. Say, "How wretched is that which your faith enjoins upon you, if you should be believers." Sahih International Say, [O Muhammad], "If the home of the Hereafter with Allah is for you alone and not the [other] people, then wish for death, if you should be truthful. Sahih International But they will never wish for it, ever, because of what their hands have put forth. And Allah is Knowing of the wrongdoers. Sahih International And you will surely find them the most greedy of people for life - [even] more than those who associate others with Allah . One of them wishes that he could be granted life a thousand years, but it would not remove him in the least from the [coming] punishment that he should be granted life. And Allah is Seeing of what they do. Sahih International Say, "Whoever is an enemy to Gabriel - it is [none but] he who has brought the Qur'an down upon your heart, [O Muhammad], by permission of Allah , confirming that which was before it and as guidance and good tidings for the believers." Sahih International Whoever is an enemy to Allah and His angels and His messengers and Gabriel and Michael - then indeed, Allah is an enemy to the disbelievers. Sahih International And We have certainly revealed to you verses [which are] clear proofs, and no one would deny them except the defiantly disobedient. Sahih International Is it not [true] that every time they took a covenant a party of them threw it away? But, [in fact], most of them do not believe. Sahih International And when a messenger from Allah came to them confirming that which was with them, a party of those who had been given the Scripture threw the Scripture of Allah behind their backs as if they did not know [what it contained]. Sahih International And they followed [instead] what the devils had recited during the reign of Solomon. It was not Solomon who disbelieved, but the devils disbelieved, teaching people magic and that which was revealed to the two angels at Babylon, Harut and Marut. But the two angels do not teach anyone unless they say, "We are a trial, so do not disbelieve [by practicing magic]." And [yet] they learn from them that by which they cause separation between a man and his wife. But they do not harm anyone through it except by permission of Allah . And the people learn what harms them and does not benefit them. But the Children of Israel certainly knew that whoever purchased the magic would not have in the Hereafter any share. And wretched is that for which they sold themselves, if they only knew. Sahih International And if they had believed and feared Allah , then the reward from Allah would have been [far] better, if they only knew. Sahih International O you who have believed, say not [to Allah 's Messenger], "Ra'ina" but say, "Unthurna" and listen. And for the disbelievers is a painful punishment. Sahih International Neither those who disbelieve from the People of the Scripture nor the polytheists wish that any good should be sent down to you from your Lord. But Allah selects for His mercy whom He wills, and Allah is the possessor of great bounty. Sahih International We do not abrogate a verse or cause it to be forgotten except that We bring forth [one] better than it or similar to it. Do you not know that Allah is over all things competent? Sahih International Do you not know that to Allah belongs the dominion of the heavens and the earth and [that] you have not besides Allah any protector or any helper? Sahih International Or do you intend to ask your Messenger as Moses was asked before? And whoever exchanges faith for disbelief has certainly strayed from the soundness of the way. Sahih International Many of the People of the Scripture wish they could turn you back to disbelief after you have believed, out of envy from themselves [even] after the truth has become clear to them. So pardon and overlook until Allah delivers His command. Indeed, Allah is over all things competent. Sahih International And establish prayer and give zakah, and whatever good you put forward for yourselves - you will find it with Allah. Indeed, Allah of what you do, is Seeing. Sahih International And they say, "None will enter Paradise except one who is a Jew or a Christian." That is [merely] their wishful thinking, Say, "Produce your proof, if you should be truthful." Sahih International Yes [on the contrary], whoever submits his face in Islam to Allah while being a doer of good will have his reward with his Lord. And no fear will there be concerning them, nor will they grieve. Sahih International The Jews say "The Christians have nothing [true] to stand on," and the Christians say, "The Jews have nothing to stand on," although they [both] recite the Scripture. Thus the polytheists speak the same as their words. But Allah will judge between them on the Day of Resurrection concerning that over which they used to differ. Sahih International And who are more unjust than those who prevent the name of Allah from being mentioned in His mosques and strive toward their destruction. It is not for them to enter them except in fear. For them in this world is disgrace, and they will have in the Hereafter a great punishment. Sahih International And to Allah belongs the east and the west. So wherever you [might] turn, there is the Face of Allah . Indeed, Allah is all-Encompassing and Knowing. Sahih International Originator of the heavens and the earth. When He decrees a matter, He only says to it, "Be," and it is. Sahih International Those who do not know say, "Why does Allah not speak to us or there come to us a sign?" Thus spoke those before them like their words. Their hearts resemble each other. We have shown clearly the signs to a people who are certain [in faith]. Sahih International Indeed, We have sent you, [O Muhammad], with the truth as a bringer of good tidings and a warner, and you will not be asked about the companions of Hellfire. Sahih International And never will the Jews or the Christians approve of you until you follow their religion. Say, "Indeed, the guidance of Allah is the [only] guidance." If you were to follow their desires after what has come to you of knowledge, you would have against Allah no protector or helper. Sahih International Those to whom We have given the Book recite it with its true recital. They [are the ones who] believe in it. And whoever disbelieves in it - it is they who are the losers. Sahih International O Children of Israel, remember My favor which I have bestowed upon you and that I preferred you over the worlds. Sahih International And fear a Day when no soul will suffice for another soul at all, and no compensation will be accepted from it, nor will any intercession benefit it, nor will they be aided. Sahih International And [mention, O Muhammad], when Abraham was tried by his Lord with commands and he fulfilled them. [ Allah ] said, "Indeed, I will make you a leader for the people." [Abraham] said, "And of my descendants?" [ Allah ] said, "My covenant does not include the wrongdoers." Sahih International And [mention] when We made the House a place of return for the people and [a place of] security. And take, [O believers], from the standing place of Abraham a place of prayer. And We charged Abraham and Ishmael, [saying], "Purify My House for those who perform Tawaf and those who are staying [there] for worship and those who bow and prostrate [in prayer]." Sahih International And [mention] when Abraham said, "My Lord, make this a secure city and provide its people with fruits - whoever of them believes in Allah and the Last Day." [ Allah ] said. "And whoever disbelieves - I will grant him enjoyment for a little; then I will force him to the punishment of the Fire, and wretched is the destination." Sahih International And [mention] when Abraham was raising the foundations of the House and [with him] Ishmael, [saying], "Our Lord, accept [this] from us. Indeed You are the Hearing, the Knowing. Sahih International Our Lord, and make us Muslims [in submission] to You and from our descendants a Muslim nation [in submission] to You. And show us our rites and accept our repentance. Indeed, You are the Accepting of repentance, the Merciful. Sahih International Our Lord, and send among them a messenger from themselves who will recite to them Your verses and teach them the Book and wisdom and purify them. Indeed, You are the Exalted in Might, the Wise." Sahih International And who would be averse to the religion of Abraham except one who makes a fool of himself. And We had chosen him in this world, and indeed he, in the Hereafter, will be among the righteous. Sahih International When his Lord said to him, "Submit", he said "I have submitted [in Islam] to the Lord of the worlds." Sahih International And Abraham instructed his sons [to do the same] and [so did] Jacob, [saying], "O my sons, indeed Allah has chosen for you this religion, so do not die except while you are Muslims." Sahih International Or were you witnesses when death approached Jacob, when he said to his sons, "What will you worship after me?" They said, "We will worship your God and the God of your fathers, Abraham and Ishmael and Isaac - one God. And we are Muslims [in submission] to Him." Sahih International That was a nation which has passed on. It will have [the consequence of] what it earned, and you will have what you have earned. And you will not be asked about what they used to do. Sahih International They say, "Be Jews or Christians [so] you will be guided." Say, "Rather, [we follow] the religion of Abraham, inclining toward truth, and he was not of the polytheists." Sahih International Say, [O believers], "We have believed in Allah and what has been revealed to us and what has been revealed to Abraham and Ishmael and Isaac and Jacob and the Descendants and what was given to Moses and Jesus and what was given to the prophets from their Lord. We make no distinction between any of them, and we are Muslims [in submission] to Him." Sahih International So if they believe in the same as you believe in, then they have been [rightly] guided; but if they turn away, they are only in dissension, and Allah will be sufficient for you against them. And He is the Hearing, the Knowing. r.
Sahih International [And say, "Ours is] the religion of Allah . And who is better than Allah in [ordaining] religion? And we are worshippers of Him." Sahih International Say, [O Muhammad], "Do you argue with us about Allah while He is our Lord and your Lord? For us are our deeds, and for you are your deeds. And we are sincere [in deed and intention] to Him." Sahih International Or do you say that Abraham and Ishmael and Isaac and Jacob and the Descendants were Jews or Christians? Say, "Are you more knowing or is Allah ?" And who is more unjust than one who conceals a testimony he has from Allah ? And Allah is not unaware of what you do. Sahih International That is a nation which has passed on. It will have [the consequence of] what it earned, and you will have what you have earned. And you will not be asked about what they used to do.